This cake is the classic devil's food cake – which is really what you want when you're eating chocolate cake. It is frosted with a sinfully incredible look chocolate frosting. 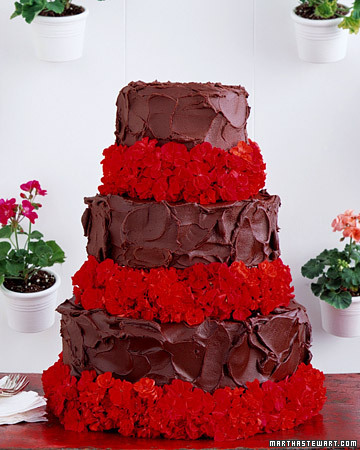 And to make it look absolutely stunning, the cake is decorated with bright red geraniums. I have to admit that I am loving the color combination – the red is so bright against that chocolate frosting. And the frosting isn't “wedding cake perfect” but instead is rustic and charming. You just cant' stop looking at the cake. Now this cake might not be ideal for all weddings. If you're having a super formal affair, it's probably not going to work. But if you're doing an informal wedding or a small family affair, this chocolate beauty would be perfect. And really, who doesn't love chocolate? I found like chocolate bombshell here.